The 'Trace' and ‘Vanished collections collection consists of one-off large-scale wearable art pieces. 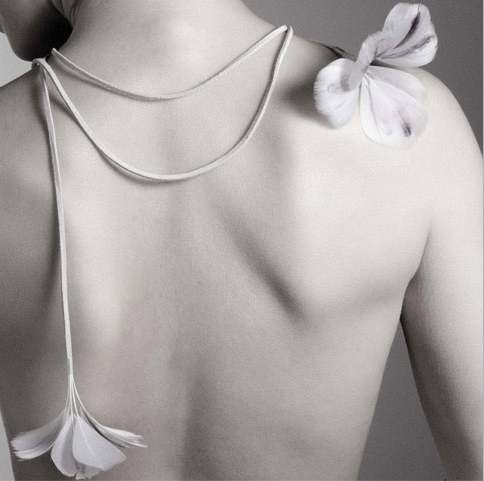 Trace are hand constructed using millinery wire, crin and are layered with hand cut white goose feathers. 'Vanished' is a collection of wraps constructed from hand stripped and printed goose feathers that are tied with invisible thread. The ' Presence ' jewellery collection is made from hand printed goose feathers combined with silver, leather and nylon monofilament. The collection includes necklaces, chains, rings, earrings, pins and neck wraps. The imagery and prints on the feathers include buttons, writing, pink petals, flowers, maps, lace, butterfly wings, faces etc. Some pieces have Swarovski crystal embellishments on them. This is now an archive collection. All work in the feather series is inspired by the ghost like and transient nature of memory and the symbolic fragile association of the feather said to be the measure of your soul.